Deciding to write a bi-weekly column about alternative, small press, and creator-owned comics was easy. I love independent comics. 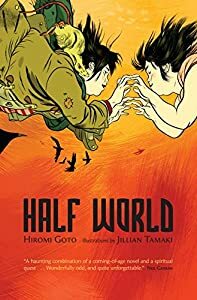 Every week I enjoy new work from the bigger-but-not-mainstream houses like Fantagraphics, Oni Press, Red 5 Comics, plus web-only comics such as XKCD, A Softer World, Secret Asian Man, and Hark! A Vagrant. I adore comics anthologies, like the annual Best of American Comics and Secret Identities, The Asian American Superhero Anthology. I go to comics conventions, read the blogs of other comics critics and historians, and get excellent recommendations from my comics-reading friends. Finding enough material to talk about wouldn’t be a problem. But did I need to? Looking for new comics to read, I kept coming across lists of “Best Of Indie Comics” which are populated by Vertigo, Dark Horse, and Image titles. While many of those books are creator owned and could be nominally considered to be “indie” only because they’re not published by Marvel or DC, we’re comparing apples to oranges by keeping Vertigo in the same category as Ursula Vernon’s webcomic Digger. By only paying attention to what the smaller-but-still-huge houses are doing, we’re ignoring some award-winning and truly amazing work. However, SF Signal already has a wonderful column about comic books (Words and Pictures, written by Brian Ruckley – go read it). Luckily for me, the field of comics is so large, and so diverse, that Ruckley and John DeNardo graciously encouraged me to carve out my own little piece of it. Keeping in mind that mainstream and independent comics often play off of each other, being inspired by and in competition with what each type of creator is doing, I’d recommend you keep reading Ruckley’s column; I certainly will be. I hope that I can add to his discussion by talking more in depth about my favorite writers and artists. Mainstream – Can be used in two ways: mainstream publishers are the major houses (see above), while mainstream comics refer to superhero and other “typical, American” comics themes like science fiction and fantasy. I use it strictly to mean “major publisher” since many small publishers have recently reclaimed speculative fiction and superhero comics as part of their oeuvre. Indie, Independent – Not from a large, mainstream, American publisher. In theory this meant companies or creators who produced work based on individual tastes and originality, not dictated by the will of fans or marketing departments. This category used to include, for example, Image, but since its founding in 1992 it’s grown to one of the largest comics producers in the United States, and while it still publishes creator-owned comics, for at least the purposes of this column Image is too large and too well-known to now truly be considered “indie”. Alternative – Following the “underground comix” movement of the 60s and 70s, “alternative comics” was originally synonymous with “independent”. “Alternative” is an umbrella term, like “indie” that can have a lot of different categories and genres under it. It is often used to describe comics without superheroes. However, some publishers** looking for a more clear description of their work now use “real mainstream” to describe comics with themes in keeping with other types of fiction: thriller, drama, detective, romance, and so on. Small Press – Originally used to describe comics without distribution, the kind of hand-made minicomics you could sometimes find for sale on the front counter at certain open-minded comic shops. Sometimes included books published for non-commercial purposes. Now refers to small-press publishers, in the same sense that “small press” is used to describe little publishers of fiction (but not self publishers or vanity presses). Creator-owned – The writer and/or artist creating the comic retains the rights to it, instead of working for hire on a project owned by the publisher. Though of course these creators are still expected to take market factors into consideration if they want to be successful, “creator owned” is often used as a hallmark of originality. Web comics – Comics posted to the Internet instead of appearing (originally) in print. Digital comics – Titles published in a digital format, such as those sold by digital distributor ComiXology. These may or may not have also been published on the web; the two terms are not synonymous. Regardless of how you define them, I love comics. I’ve explored comics as a reader and fan, but I’ve also written about comics from an academic perspective in the past. My college degrees are in Fine Arts and Art History, and though I studied antique books, prints, and printmaking techniques in school (and just read comics for fun) it turns out that I couldn’t have done much better if I wanted to prepare myself for serious study of sequential art. I’m excited to have a forum to share what I’m reading now. Want me to review your work? I’m primarily looking for comics with a speculative fiction element, in keeping with the theme of SF Signal, but if your comic is fantasy, science fiction, horror, weird, magic realism, or some other style of “strange”, let me know! You can reach me at carriecuinn@gmail.com, or leave a comment below. * Definitions are always open to interpretation. Mine are meant to give you a frame of reference for partaking in my discussion of comics, and aren’t meant to define all comics everywhere for everyone. Carrie Cuinn is an author, editor, bibliophile, modernist, and geek. In her spare time she reads, draws, makes things, takes other things apart, and sometimes publishes books. You can find her online at @CarrieCuinn or at http://carriecuinn.com. Did You Hear John Bivens on The Functional Nerds Podcast? First post! Establishing boundaries and definitions are a good thing, although I suspect there are some boundary-skipping comics out there. It’s impossible to pin all of comics down into neat categories, but I wanted to establish a framework for comparison. I love that comics includes so many unique and special works, titles that can’t be confined to one genre. It’s as varied as fiction is, now, and I hope to be able to show off a few things our readers might not otherwise have heard of. SF Signal is SFX’s 2011 Literary Blog of the Year!